There are two things I hate in college football; bad calls and biased commentators. Those refs made some bad calls on both teams. Just call the game. 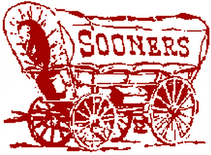 Brent Musburger has hated OU ever since I attended there back in the 80's. Just call the game. I'm with you! I hate bad calls and back commentators! I really do! I've never liked Brent...he's too full of himself! Well...sorry for OU...but, I'm hoping this will mean UA will be #1 this week...unless Notre Dame jumps to #1...or USC!!!! Hey rick how are you? I agree with you 100% on the OU/TEXAS game. As much as i hated seeing them lose, #4 is a very good place to be right now. By the way, I love your blog and Flickr account. I'm glad you like my blog and Flickr. Did you also look at my Weather Underground Pictures? The link is in the RH column. Good to hear from you. I like your pics. What kind of camera do you have?